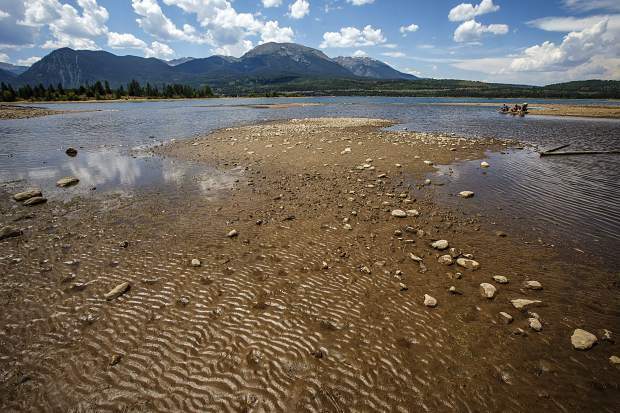 Lake Dillon bottoming out due to drought, Friday, July 6, near Frisco. What a difference a few weeks can make. Over the past month, Colorado has gone from nearly 70 percent of the state in drought to less than 5 percent. That drenching happened over the past month, a four-week period that included the snowiest early March that most Summit residents can remember. Yet it remains to be seen whether the season’s precipitation will put much of a dent on the region’s near-20-year drought. The U.S. Drought Monitor, which uses water flow levels and other data to assess drought conditions across the country, shows that only 6.4 percent of the state’s land area is experiencing drought conditions, with 46.1 percent being considered at least “abnormally dry.” Compare that to the middle of February, when 67.2 percent of the state was in a drought and 91.8 percent abnormally dry. For Summit County, the difference has been especially staggering. Summit and 39.7 percent of Colorado were experiencing at least a “severe drought” on Feb. 19. Today, the county is back to normal conditions, with only 0.6 percent of the state experiencing severe drought or worse. The reason for the striking drop in drought area is obvious: it’s all about the snow. The state now stands at 140 percent of normal snowpack. Southwest Colorado, which suffered the most from last year’s arid summer, is seeing anywhere from 150 to 157 percent average snowpack. Government officials and conservationists worried about the impact one of Colorado’s driest winters on record would have on water levels in reservoirs across the region. The hot, dry spring and summer of 2018 was also accompanied by one of the worst wildfire seasons in state history. And while the new precipitation is very promising, it is just one drop in the stream of time. According to the drought monitor, Colorado has been experiencing sustained dryness since the late ’90s. Since 2000, the longest duration of drought in Colorado lasted 395 weeks, or nearly eight years, beginning in October 2001 and ending in May 2009. Pokrandt said that since 2000, Colorado has only had four years at or above average levels. The 2018-19 winter will be the fifth, but he said one big year does not end a long-term drought. County Commissioner Karn Stiegelmeier echoed Pokrandt’s words of caution, noting that the drought was so bad just last summer that remnants of Old Dillon resurfaced from the bottom of the lake. There is a lot of recovery left to go, she said. Stiegelmeier said that this snowfall may be a “blip” in the long term, and if the summer is once again hot and dry, Summit might run into the same problems as last year. Regardless of whether the long-term picture is made any rosier, this upcoming spring will be very muddy, at the very least. Dillon ranger Bill Jackson cautioned residents and visitors to not use muddy trails if at all possible, as they can be deceptively dangerous and use during mud season can contribute to long-term trail damage. Additionally, Jackson cautioned adventurers to avoid crossing creeks and waterways to get where they’re going. Travelers in the area are advised to follow standard precautions in the spring, including notifying someone of where they are heading to and keeping an eye on weather forecasts for potential storms and flash flooding.